Today is Saturday. Yes, it’s the day of the week, but it marks the beginning and end of so much. It’s the day after Good Friday. Let’s take a look at that. The death of Christ ushered in grief unspeakable. Saturday became a day where many lost hope in all they knew. The Savior of the world, now dead. All people knew was the hope of the world, their world, had suffered intensely and then died. What is good about that? 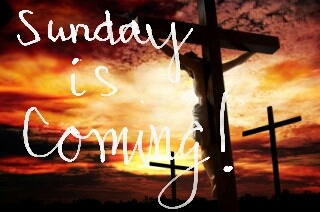 Good Friday would NEVER in a billion years be considered good…unless you knew Sunday was coming. The grief of Saturday, and the tears of pain and heartache – those would give way to life. The impossible. The good became part of Friday when the Savior of mankind rose from the dead on the third day. That is one of the most general looks at the Christian story of Jesus being crucified, dead and entombed, and rising from the dead – leaving an empty tomb. He had risen, and hope restored. This season of my life is arguably the most difficult and painful of any I’ve ever walked through. Some days the guiding force of life seem to be pain, grief, and hopelessness. Those things dictate the way I feel and relate to life on a given day. Today is my Saturday. The biggest motivating force that keeps whatever hope alive is that Sunday will dawn. Just as those in Jesus day found hope was in fact alive, I have to believe that there is life yet to be lived; life still possesses the possibility of hope for something beyond pain. I have to believe that Sunday will dawn. I’m not there right now, and frankly, I don’t know how to hold onto that hope. Today is Saturday, and I will perhaps learn to embrace the whatever is, right now. When I feel like life is impossible, and don’t know how to keep walking, I’ll just know that maybe – just maybe, Sunday will dawn. Wishing you a Blessed and Happy Easter. Smiles. Thank you Marion. Hugs to you.